Clare Fox, executive director of the Los Angeles Food Policy Council, gave an informative presentation on “Good Food For Everyone.” Photo by Sarah Dutton. Kathleen Blakistone, co-creator of Moonwater Farm, kicked off Sustainability Day with an informative presentation on regenerative urban farming. Photo by Sarah Dutton. 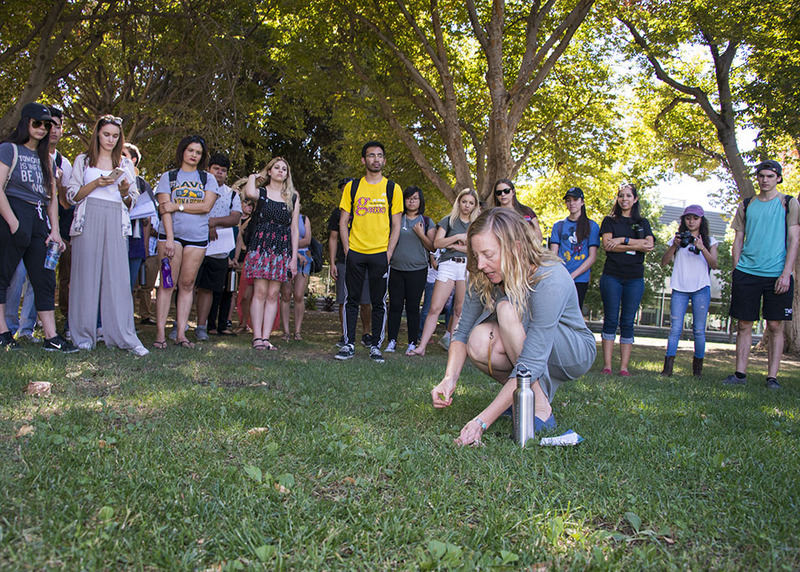 Erica Wohldmann, Interim Director of the Institute for Sustainability, led a walking tour on campus highlighting edible and medicinal plants growing around us. Photo by David J. Hawkins. Students and faculty poured into the Northridge Center in the University Student Union on Oct. 25 for a full day of engaging presentations at California State University, Northridge’s annual Sustainability Day. The CSUN Institute for Sustainability hosted the day of free activities focused on the issue of food justice and the event’s theme, World Food Day. CSUN psychology professor and Interim Director of the Institute for Sustainability Erica Wohldmann led the all-day program, which kicked off with informative presentations by guest speakers Kathleen Blakistone, co-creator of Moonwater Farm, located in Compton, CA and Clare Fox, executive director of the Los Angeles Food Policy Council. Moonwater Farm is an urban microfarm in Compton designed to provide youth and residents of South Los Angeles with opportunities to explore modern urban agriculture. 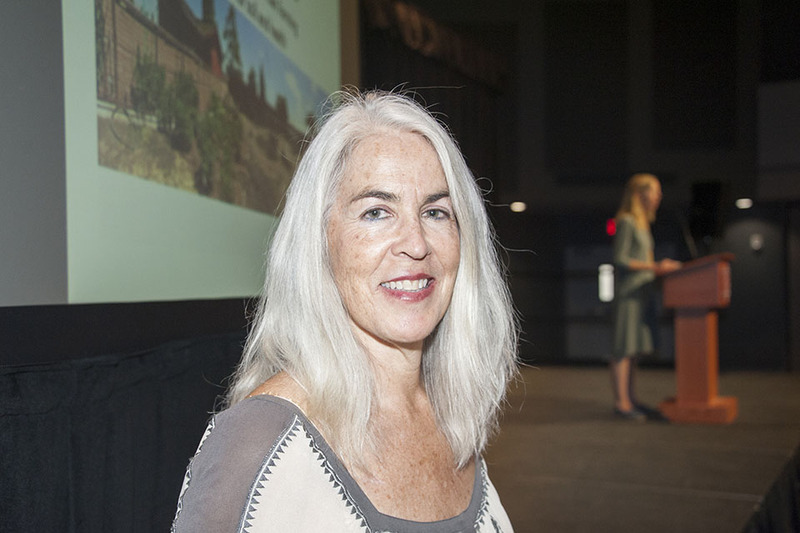 In her keynote address, Blakistone discussed regenerative urban farming, which is an approach to farming that contributes to the health of the overall community ecosystem that replenishes the land as it is being used, resulting to a better food supply. Blakistone also discussed the issues of ffood insecurity, obesity and social factors that affect community members’ general health. Moonwater Farm encourages young visitors, staff and local residents to embark on a unique experience by “escaping” the city through a range of outdoor-based activities. The farm combines farming and gardening activities with educational field trips, plant-based cooking classes and creative arts activities. Clare Fox, executive director of the Los Angeles Food Policy Council, was up next with a presentation on “Good Food For Everyone.” With the food policy council, Fox collaborates with a large network of ​​government agencies, nonprofits and community leaders to create policy and system changes for a sustainable and fair food system. Former Mayor Antonio Villaraigosa established the food policy council in January 2011. CSUN student Bridget Fornaro, journalism and public relations major, attended Sustainability Day to learn more about ways she can help conserve and contribute to sustainability efforts on campus and in the community, she said. Before switching to journalism, Fornaro said, she began her college journey as an environmental science major. The Princeton Review featured CSUN in their seventh annual “Green Guide” and rated CSUN a score of 95 out of 99 for the university’s sustainability in higher education in 2017. In the following day after Sustainability Day, Oct. 26, CSUN celebrated the opening of AS Sustainability Center, the first of its kind in the CSU system, adjacent to the University Student Union. CSUN composting efforts converted more than 50,000 pounds of kitchen scraps into 12,000 pounds of soil, which was recycled and used in the campus Sustainability Food Garden in 2016, according to Wohldmann, who founded the garden. The garden and compost area are located on the northeast side of the campus, between the baseball and softball fields, directly behind Northridge Academy High School. 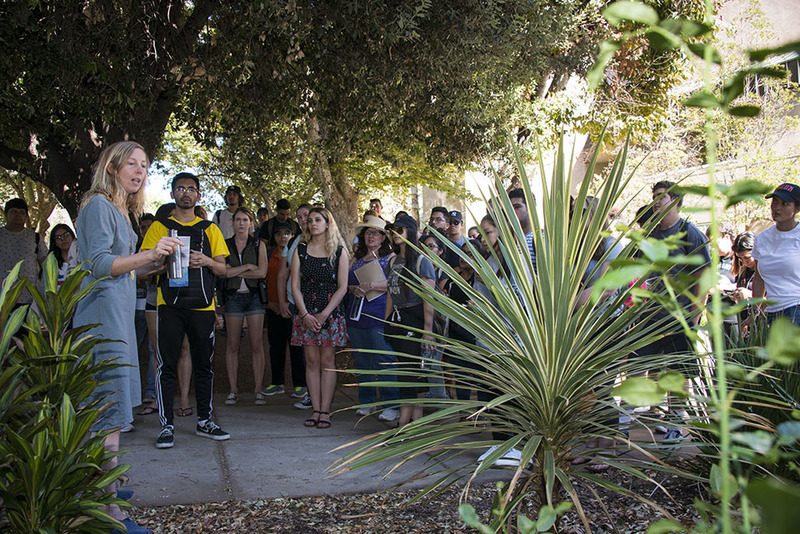 After the Sustainability Day guest speakers’ presentations, Wohldmann led students and faculty out of the Northridge Center and around the campus for a walking tour that highlighted the many edible and medicinal plants growing all around us. Wohldmann holds a joint Ph.D. in psychology and cognitive science, and her research focuses on the psychology of food and the food choices people make. She started the tour by sharing her experience of living in the forest for six months, living only off the foods she could find in the wild. On a recent sabbatical, Wohldmann traveled through the western U.S. to understand how a deeper connection with nature and food impacts our worldview. “We live in a world where our value is measured by how much we consume — how much stuff we buy — and this view is neither healthy nor sustainable,” she said. Many of the edible plants growing around us can’t be found in stores, but they’re quite safe, she said. Among the things tour participants learned was that all roses are edible, “but only the ones that smell good are delicious,” Wohldmann quipped. She also noted that one of the most common weeds on campus lawns, the broadleaf plantain, has a high content of antimicrobial properties and is great for medicinal purposes. The tour made several stops, where Wohldmann pointed out a variety of different plants that were edible or had some medicinal use. “I’ve traveled to all continents except Antarctica, and I’ve found these plants in all of these places,” Wohldmann said. Tour participants left with encouraging words from Wohldmann to keep learning about plants. “Once you learn about what plants are edible, you never have to worry about running out of food!” she said. 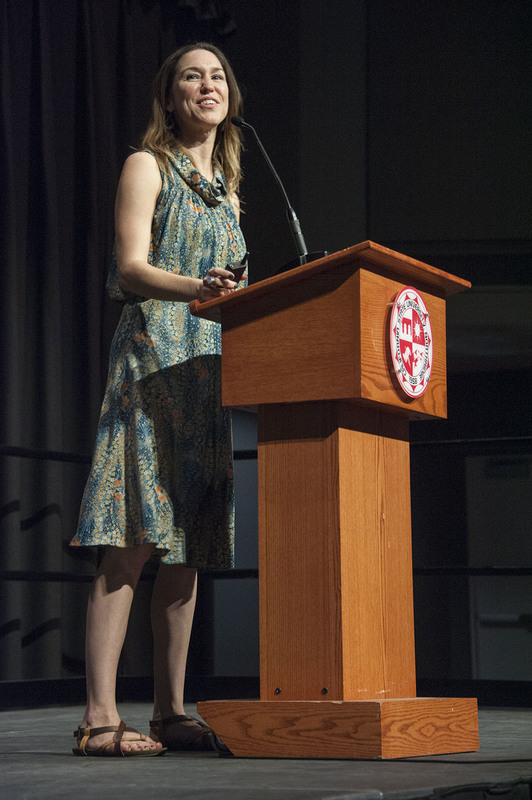 Sustainability Day also featured a screening of Just Eat It, a documentary about food waste and food rescue, and an afternoon presentation by Gina K. Thornburg, community activist and scholar of alternative food systems. CSUN’s Marilyn Magaram Center for Food Science, Nutrition and Dietetics also hosted a cooking demonstration, showing attendees how to make healthy meals with ingredients sourced from the CSUN Wellness Garden. To get involved with CSUN’s sustainability efforts, please visit the CSUN Institute for Sustainability website. To learn more about Moonwater Farm, visit moonwaterfarm.net. To learn more about The Los Angeles Food Policy Council, please visit goodfoodla.org.